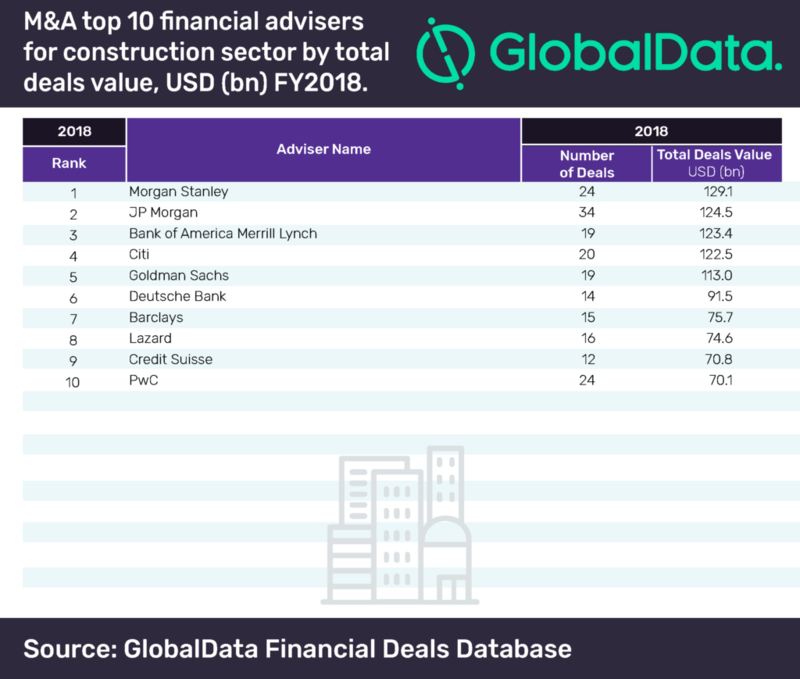 Morgan Stanley has topped the latest M&A league table of the top 10 financial advisers in the construction sector for FY2018, compiled by GlobalData, a leading data analytics company. Morgan Stanley beat its fellow counterparts JP Morgan, Bank of America Merrill Lynch and Citi to lead the table with 24 deals worth $129.1bn, including the sector’s highest value deal–the $40.44bn investment by ACS, Hochtief and Atlantia in Abertis Infraestructuras. According to GlobalData, which tracks all merger and acquisition, private equity/venture capital and asset transaction activity around the world to compile the league table, JP Morgan occupied second position with 34 transactions worth $124.5bn, followed by Bank of America Merrill Lynch with 19 transactions worth $123.4bn. The construction sector saw some high value deals during FY2018. The overall value increased by 25.97% from $281.3bn in 2017 to $354.4bn in 2018 while the volume increased by 10.65% from 2,638 in 2017 to 2,919 in 2018. With 376 deals valued at $1.09trn, Goldman Sachs took the top spot in the global league table of top 20 M&A financial advisers released by GlobalData recently. Morgan Stanley stood third in the global rankings. 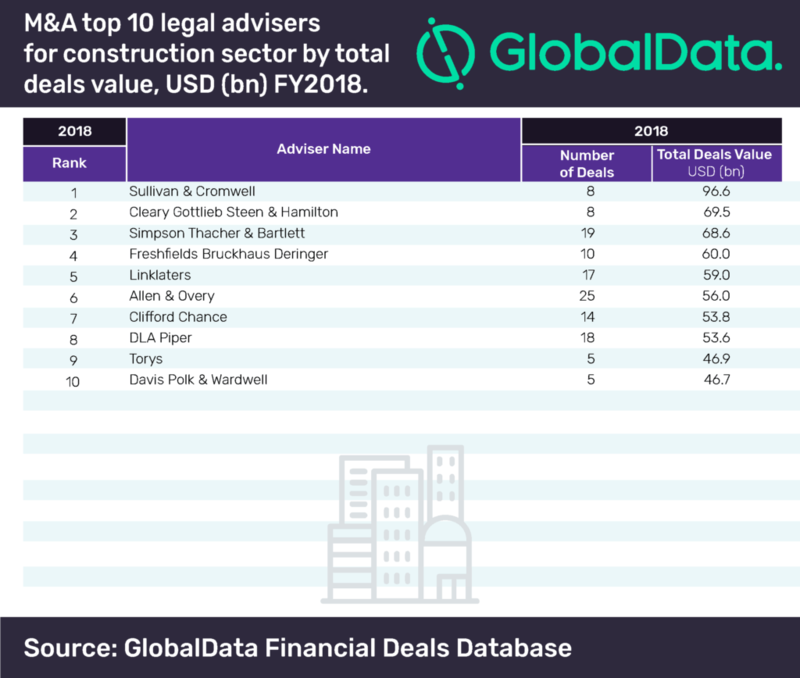 US-based Sullivan & Cromwell topped the list of the top 10 legal advisers by value with eight deals worth $96.6bn.The sixth ranked Allen & Overy emerged as the top adviser in terms of volumes with 25 deals during the year. In the global league table of top 20 M&A legal advisers, Sullivan & Cromwell occupied fourth position.